Thanks to two donations of past programmes and some notes and reminiscences we have been able to piece together the history of Carlisle Music Society. The Society began as the North Cumberland Recital Club, with an interim existence as North Cumbria Recitals. Since 2013 it has been known as Carlisle Music Society. 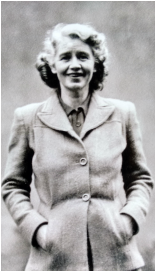 Phyllis Cameron Simpson, a music mistress at the Carlisle and County High School, instigated the formation of the Club in 1950/51. The name of the Club was chosen with care since a flourishing Carlisle Music Society already existed. Membership grew rapidly; in the first season it numbered 276, peaked at over 300 in the mid-1950s and then began to decline. By 1960 it had fallen to below 230. When the Club was first formed some people declared that they would join if only to hear Kathleen Ferrier sing. Kathleen, a friend of Phyllis Simpson, had promised to sing at one of the concerts if her agent was in agreement. In fact she sang twice, in January and December 1952. 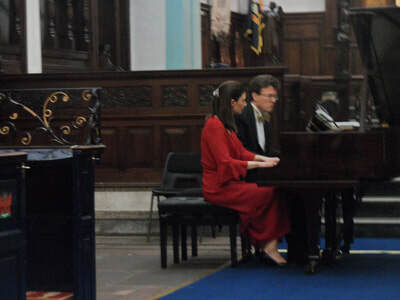 Sadly the December recital, which was given in the Central Hall, Fisher Street was to be her last song recital. She died of cancer the following year. Almost all concerts were given in the Hall of the Carlisle and County High School. Three concerts were given each year, between October and March. In 1953 the piano then in use was threatened by the fingers of the great Wilhelm Kempff. He declared on first seeing the instrument that he would break it with one chord, but the piano stood up to his powerful playing. A surviving anecdote reports that several audience members felt quite sea-sick on listening to him play Liszt's St Francis de Paul walking on the waters. It was the pianist Rosalyn Tureck who later helped Phyllis Simpson to choose a new piano. Sadly, we have been unable to verify that this is the Steinway Grand piano currently owned by the Society and housed in St Cuthbert's Church. Between 1969 and 1979 concerts were generally held in The Fratry, with a small number at Cumbria College of Art and Design. From the 1979-80 season onwards the venue has been St Cuthbert's Church. 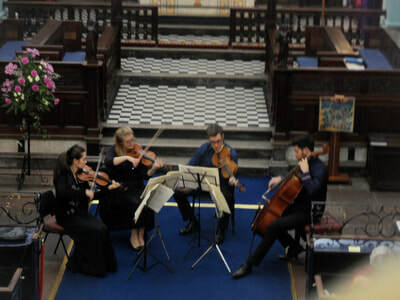 Well-known international artistes and ensembles continued to perform in Carlisle, such greats as the Warsaw Piano Quintet, the Early Music Consort of London, the Lindsay String Quartet, clarinettist Jack Brymer and cellist Steven Isserlis. Our programme archive provides a wealth of interesting detail on the life of the Society (Club). In 1983 the violist Pierre Xuereb gave the first performance in England of the Hindemith Sonata for Solo Viola. A young Sam Heywood of St Bees gave a concert in September 1986. 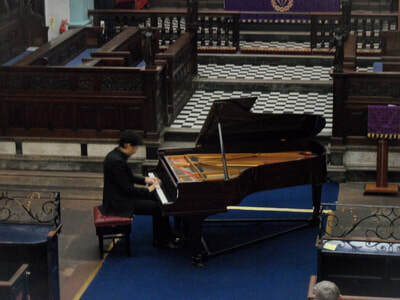 He had won the North of England piano final of the BBC Young Musician of the Year competition. Coloured programme covers were introduced in the 1984-85 season and were headed, Celebrity Concerts at St Cuthbert's Carlisle. Commercial sponsorship was introduced at the end of the 1980s and the fact that the firm Window World sponsored several concerts during the 1990s perhaps mirrors the popularity of double glazing during that decade. In overall terms there has been a decline in audience and subscriber numbers, but recent years have shown a small but pleasing upturn. 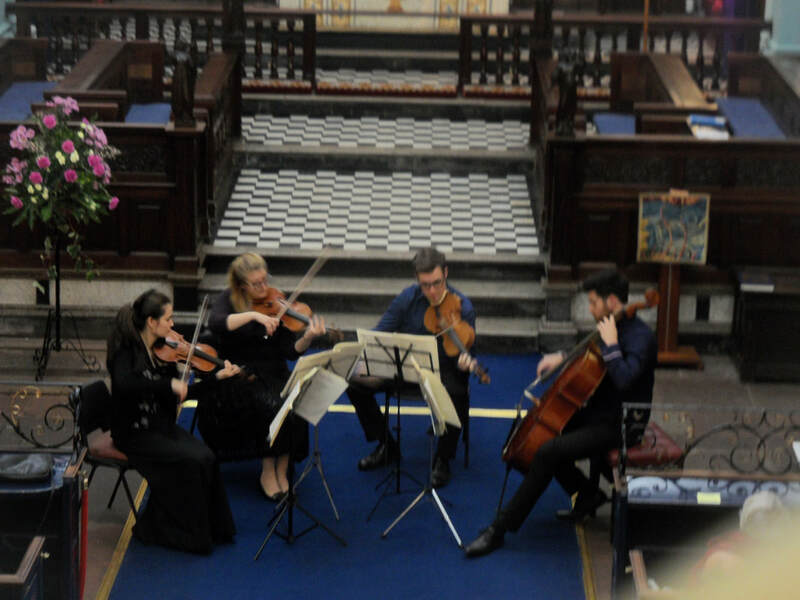 The Society continues to present six concerts a year.